Let's start this review by getting one thing out of the way first: the Samsung Galaxy S II is the best Android phone on the market, by far. It may also be the best smartphone on the market, period; even if we think this ultimately comes down to personal preference. The Galaxy S II combines one of the biggest and best screens on the market, with blazing performance, functional, stable software and decent battery life. Read our Samsung Galaxy S II hands-on and check out our Samsung Galaxy S II vs HTC Sensation smartphone showdown. The Samsung Galaxy S II is constructed largely from plastic, but we don't think this detracts from its overall appeal. In fact, we think it actually enhances it purely for the fact that the Galaxy S II is just 8.49mm thick. This makes it thinner than the iPhone 4 and likely the thinnest smartphone in the world. The plastic construction means the Galaxy S II weighs a very light 116g, but its sheer size makes it comfortable to hold, and easy to slip into your pocket. The design does not feel flimsy or poorly constructed, and we like the attractive carbon-like finish on the rear battery cover. Although this part of the phone is thin, difficult to remove and does initially feel a little flimsy, it doesn't rattle or creak once clicked into place. The Samsung Galaxy S II's design may not evoke the same plaudits as competitors like the HTC Desire HD — which is constructed from a single block of aluminium — but Samsung seems to have struck a near-perfect balance with size, weight and aesthetic appeal. The Samsung Galaxy S II has a physical (tactile) home key, along with touch-sensitive back and menu buttons. The power/lock screen button is perfectly positioned on the right, making it easy to access single-handedly, while the same applies to the left-mounted volume controls. The only missing features are a notification LED, and a physical camera shutter key — it's hard to keep the Galaxy S II still when taking a photo with the on-screen shutter button. 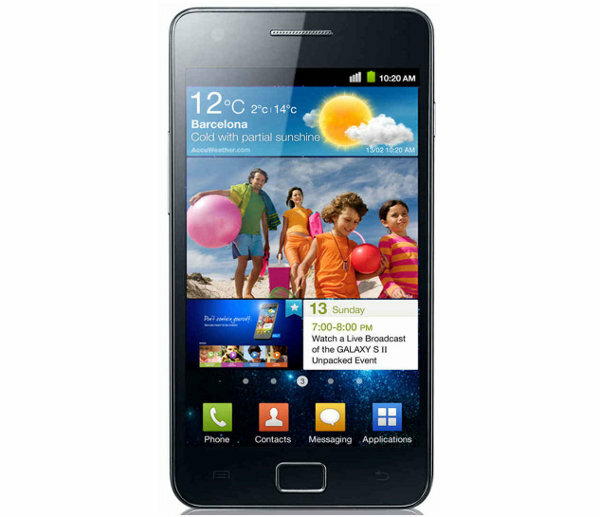 The killer feature of the Samsung Galaxy S II is its 4.3in Super AMOLED Plus display. It's one of the best screens we've seen on a smartphone to date, producing vivid colours, superb viewing angles and rich brightness. Sunlight legibility is also superb; on full brightness, the Galaxy S II's screen can easily be seen in strong direct sunlight. These attributes combined with the large 4.3in size mean the Galaxy S II is the perfect smartphone for video playback. The iPhone 4's 3.5in screen looks almost tiny in comparison, and the extra screen real estate really makes a difference in day-to-day use — particularly given Android's widget-focused home screens. Two minor sour points concerning the display are the fact that some images do appear to look a little oversaturated, and that text is sometimes hard to read, especially when zoomed out. The latter is particularly evident in the Web browser; small fonts seem to look worse than other Android phones with the same resolution. The Samsung Galaxy S II's WVGA resolution of 800x480 can't quite match the iPhone 4's "retina" resolution (960x640), or the qHD resolution (540x960) of the Motorola Atrix, but the resolution itself doesn't seem to be the cause — we feel this might be a rendering issue. The Samsung Galaxy S II has a 4.3in Super AMOLED Plus display that produces vivid colours, superb viewing angles and rich brightness. The Samsung Galaxy S II runs the latest version of Google's Android operating system, 2.3 "Gingerbread", and also features Samsung's TouchWIZ 4.0 UI overlay. Although it is not as comprehensive as HTC's Sense UI seen on phones like the HTC Desire and Desire HD, TouchWIZ UI is both attractive and functional. The default Samsung weather, clock, and power widgets quickly found a permanent home on our screen, and you can easily customise the main app menu by creating folders. Annoyingly, you can't automatically sort the icons in the main menu, though you can move them around manually. Samsung has included a number of other nifty functions in its TouchWIZ software. Swiping left on a contact in your phonebook will immediately call that person, and swiping right will message them. You can also turn the Galaxy S II over on a desk or table to silence an incoming call. Other "motion based" features include the ability to tap and hold the screen at two points and tilt back and forth to zoom in and out of the browser or gallery, and move a selected home screen icon to another screen by holding it and moving the phone left of right. These features will wow onlookers, but aren't practical for day-to-day use. The Galaxy S II also comes with four Samsung software hubs: the social hub, readers hub, game hub and music hub. 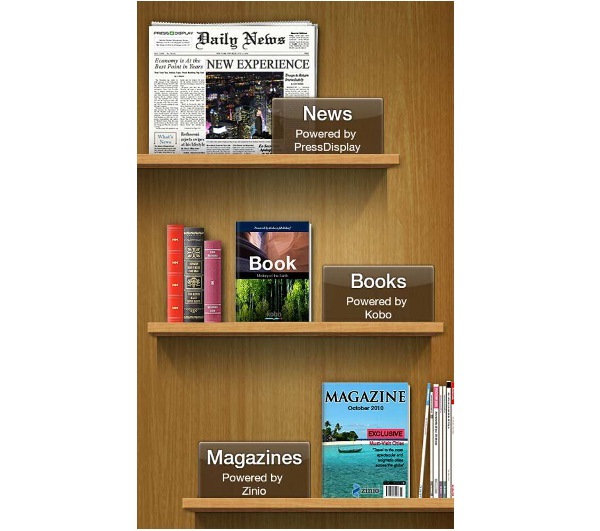 Of these four, we found the readers hub (which integrates electronic newspapers, books and magazines) the most useful — even if is just quick access to Kobo and Zinio apps which are freely available to download from the Android Market. As for the other Samsung hubs, we prefer using separate apps to social hub (which groups social networking, e-mail and IM accounts), the music hub is a music service not available in Australia, and the games hub simply searches for and lists compatible games in the Android Market. There are a few niggling aspects about Samsung's TouchWIZ UI that we don't like, but none are a deal breaker. The default lock screen is slow to slide and feels sluggish on such a top-end phone, the TouchWIZ home screens don't scroll as fast as we'd like (even if the overall experience is smooth), and the phone is sometimes slow to wake when unlocked. Finally, we like Samsung's default keyboard in general, but it has annoyingly replaced the comma key with a voice input button. The Galaxy S II comes with a Vlingo Voice Talk app that can be activated by double tapping the home button. Like most voice activated software, the process is slow and the results are often hit and miss, though it does work reasonably well when combined with Google Maps Navigation in the car — provided you are speaking close enough to the microphone.